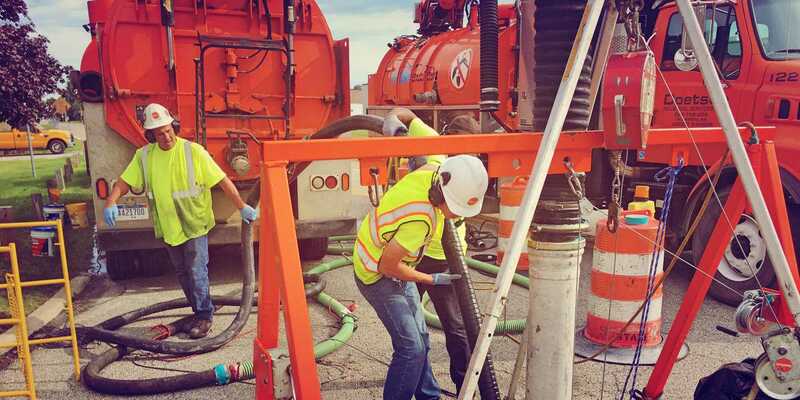 With the stink of congealed grease, oil and fat serving as a backdrop, Macomb County Public Works officials remind everyone of the consequences of pouring everything down the drain. One day after revealing the massive fatberg found in Lakeshore Interceptor drain, Macomb County Public Works Commissioner hoped to use the discovery as a teaching moment for both residents and business owners. The MCPW displayed chunks of the fatberg at the Clintondale Pump Station in Clinton Township, part of a 100-foot long, 11-foot wide, six-foot tall blob that was found about a year ago during a routine inspection. Public Works Operations and Flow Manager Vince Astorino said cameras down in the sewer got stuck in the fatberg during the inspection. Food waste is a main ingredient of the fatberg, but not the only cause of the gelatinous blockage. The blob was about 100 feet long, six feet tall, and weighed about 19 tons when county officials decided it was time to remove it. If they had let it grow, the “fatberg” would have blocked the entire pipe and spewed sewage out into the environment. The county called Doetsch Environmental Services to remove the gooey mass. At first, the company tried suction, but the fatberg was too dense. Next, the removal crew tried to cut up the fatberg with high-pressure water—but it was too tough. Ultimately, Doetsch workers had to crawl into the pipe with handsaws and hack the stinking mass into portable pieces, some of which were sucked out, and some of which had to be carried out. Joe Schotthoefer of Doetsch Environmental said it was by far the largest fatberg he’d ever seen in 25 years of working in the business. The county was charged about $100,000 to have the fatberg removed. The blockage occurred at the Clintondale Pump Station, located south of Shook Road and west of Interstate 94 in Clinton Township because it is “the end of the line,” which serves Clinton, Harrison, Chesterfield and Lenox townships, plus the village of New Haven. The 19-ton fatberg, which has now been mostly cleared, was sent to a landfill. County officials said the public can also help by eliminating or reducing all garbage disposal use. If you want to eliminate food solids from clogging the grease trap in your commercial kitchen, consider installing The Drain Strainer. Invented by a former restaurant owner, our food solids separator is an effective and affordable commercial garbage disposal alternative.